WHAT'S IN MY MAMA'S PURSE? Much more than bandages and bananas! You won't believe your eyes because so much fun hides in my mama's purse. From a yellow moose and a caboose made of juice to a trout and numbers to count, Mama's purse is full of super silly surprises. You'll never guess what zooms out next! 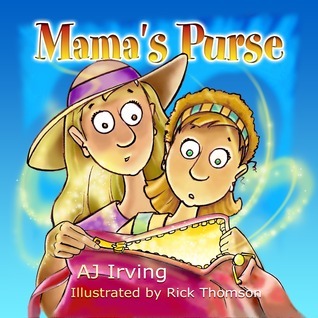 Using rhyming text and a great big imagination, AJ Irving shares the possibilities and mainly impossibilities of what could be in Mama's Purse! The rhyming works well with words like goose, juice, moose and others like bassoon, goon and typhoon. The illustrator Rick Thomson did an excellent job of translating the words into pictures! The pictures definitely added greatly to the book. The book definitely went out there in the imagination realm! There aren't too many purses with planes and flying pigs in them. What out of the way crazy thing can you imagine in Mama's Purse? Leave me a comment with your answer and I will randomly choose one person to win a copy of this book! Rocks. seriously..just the other day I was cleaning out my purse and I had an interior pocket that was packed full of rocks. My guess is the boys were collecting them one day while we were out and I just stuck them in as they were handed to me. No wonder my purse has been so heavy. Fingernail polish...then, she could have a quail that yells and wanted pink on its nails. Well if it needs to be one of the rhyming words then I would say caboose, hmm maybe a train could actually fit in the purse! I bet a silly raccoon is in Mamma's Purse! I was always scared to look in my Mamma's Purse. There's surely a genie in there too! Random Generator picked number 12! Georgia is our winner!